In an instant, a new invasive pest or disease can wreck havoc on our forests. Many already are, causing much concern among residents and people in the scientific community. The United States trades with many other countries and thousands of people fly in and out of our country every day. This allows for new and potentially devastating tree pests, (both insects and disease) to be introduced to our woodland and landscape trees. Many of the exotics that make their way into our country will not find suitable hosts to be able to survive, but a few will become successful and flourish, causing great harm to our native trees. If left unchecked, these new pest species can spread rapidly thereby being labeled as invasive with the potential of devastating their host species. “Examples of past impacts are the losses of American chestnut and elm from both our urban landscapes and forest stands. The loss of the American chestnut and elm affected not only the trees, but also the wildlife that was dependent on the trees for food and shelter. The lost trees may have been shading stream and river waterways. The loss of shade is contributing to increased water temperatures, which reduces the available dissolved oxygen and causes a reduction of fish populations. It is expected that as the world’s population increases, we will start to see more and more disease and invasive species problems. Early detection of new diseases and invasive pests are key in preventing a total loss of our native forests. In an effort to enable early detection of new invasive tree pests, Michigan State University Extension has developed the Eyes on the Forest program. 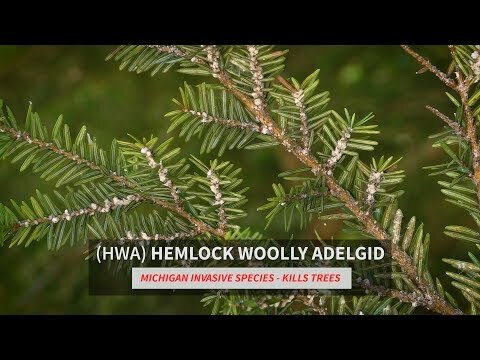 With initial funding from a Michigan Department of Natural Resources grant, this ongoing program is an effort to establish a network of sentinel trees across the state. Volunteer enthusiasts select the sentinel tree of their choosing and report on the trees overall general health using the online Midwest Invasive Species Network.